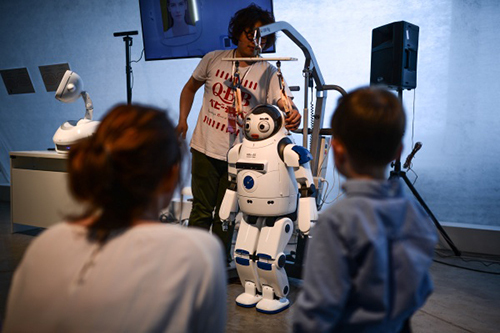 The world’s most famous robots have arrived in Moscow to participate in the Robot Ball, an exciting science event that will be running at the Artplay Design Center from May 15 to June 15. 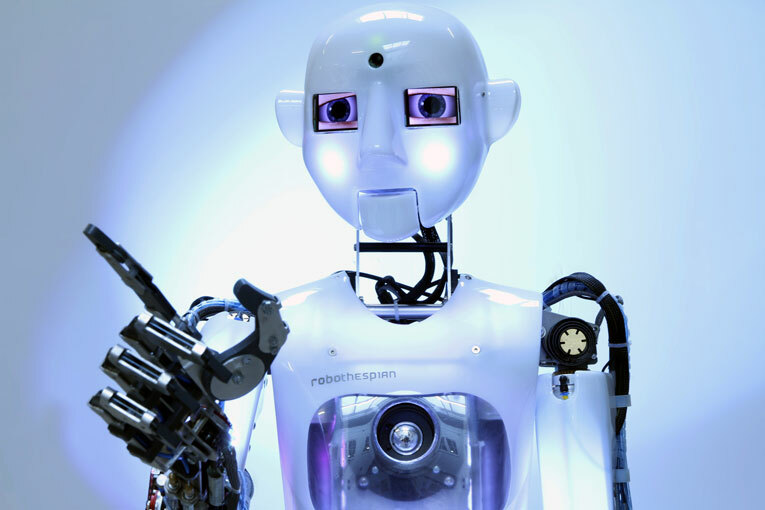 The event will include an interactive Robo-exhibition involving over 40 of the most entertaining and technologically advanced robots from around the world, as well as an international Robo-forum dedicated to innovations and prospects of the robotechnic industry. Electronic elves from more than 20 countries descended on Moscow to shake a leg or two and sing during the month-long Ball of Robots. An unmanned aerial vehicle (UAV), commonly known as a drone and referred to as a Remotely Piloted Aircraft (RPA) by the ICAO, is an aircraft without a human pilot aboard. Its flight is controlled either autonomously by onboard computers or by the remote control of a pilot on the ground or in another vehicle. They are usually deployed for military and special operation applications, but also used in a small but growing number of civil applications, such as policing and firefighting, and nonmilitary security work, such as surveillance of pipelines. UAVs are often preferred for missions that are too “dull, dirty or dangerous” for manned aircraft. The idea of a pilotless aircraft is not a new concept. The concept of drones dates back to the mid-1800s, when Austrians sent off unmanned, bomb-filled balloons as a way to attack Venice. The drone we see today started innovation in the early 1900s, and was originally used for target practice to train military personnel. It continued to be developed during World War I, when the Dayton-Wright Airplane Company came up with the a pilotless aerial torpedo that would drop and explode at a particular, preset time. The earliest attempt at a powered unmanned aerial vehicle was A. M. Low’s “Aerial Target” of 1916. Nikola Tesla described a fleet of unmanned aerial combat vehicles in 1915. A number of remote-controlled airplane advances followed during and after World War I, including the Hewitt-Sperry Automatic Airplane. The first scale RPV (Remote Piloted Vehicle) was developed by the film star and model airplane enthusiast Reginald Denny in 1935. More were made in the technology rush during World War II; these were used both to train antiaircraft gunners and to fly attack missions. Nazi Germany also produced and used various UAV aircraft during the course of WWII. Jet engines were applied after World War II in such types as the Teledyne Ryan Firebee I of 1951, while companies like Beechcraft also got in the game with their Model 1001 for the United States Navy in 1955. Nevertheless, they were little more than remote-controlled airplanes until the Vietnam Era. There are two prominent UAV programs within the United States: that of the military and that of the Central Intelligence Agency (CIA). The military’s UAV program is overt, meaning that the public recognizes which government operates it and, therefore, it only operates where US troops are stationed. The CIA’s program is clandestine. Missions performed by the CIA’s UAV program do not always occur where US troops are stationed. 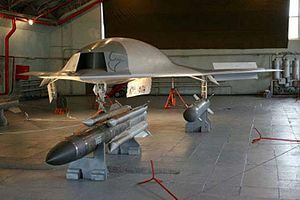 The CIA’s UAV program was commissioned as a result of the September 11 terrorist attacks and the increasing emphasis on operations for intelligence gathering in 2004. This clandestine program is primarily being used in Afghanistan, Pakistan, Yemen, and Somalia. UAVs collect intelligence in these countries by loitering around their target. The CIA’s first UAV program is called the Eagle Program. It was led by Duane Clarridge, the director of the Counterterrorism Center. This program constructed the CIA’s first using “off the shelf technology,” which included items such as garage door openers and model airplanes. The West has always been a little squeamish about the idea of arming robots. Despite decades of development, no systems have ever been deployed and a vocal human rights campaign means it’s unlikely to happen in the near future. The Russians, on the other hand, appear to be rather less concerned. Last month, Dmitry Andreyev of the Russian Strategic Missile Forces announced that mobile robots would be standing guard over five ballistic missile installations. These robots can detect and destroy targets, without human involvement. 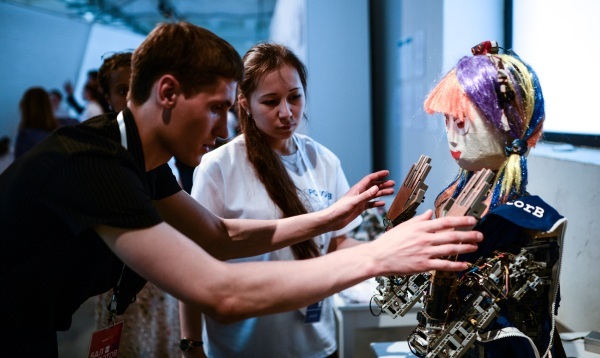 Russia, it seems, is taking the lead in a new robotic arms race. The robot sentry, aka the “mobile robotic complex“, was developed by Izhevsk Radio Plant, a company based 1200 kilometres east of Moscow. It weighs around 900 kilograms and has cameras, a laser rangefinder and radar sensors. For fire power it has a 12.7-millimetre heavy machine gun, with optional smaller weapons. It is quick too, hitting speeds of 45 kilometres per hour on a petrol engine. It can operate for 10 hours, or switch to sleep mode for a week. The makers put the sentry robot through its paces at an arms fair in Russia last year. 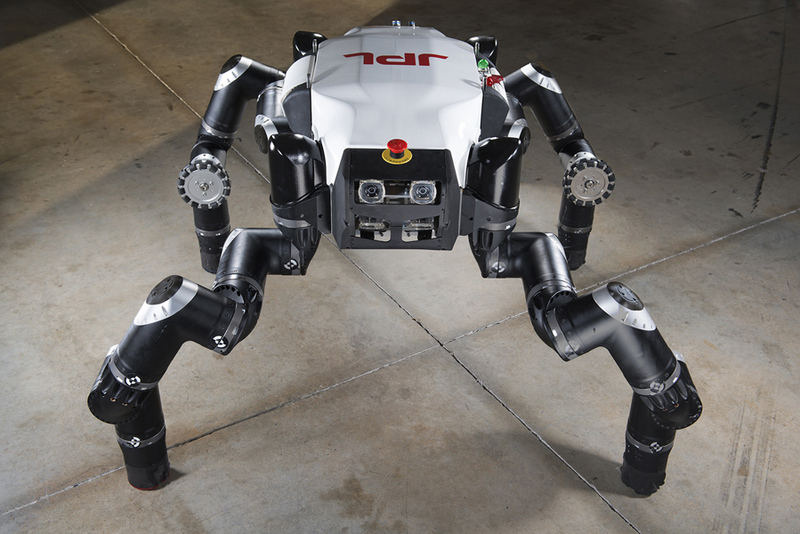 Andreyev describes the robots as being able to engage targets in automatic as well as semi-automatic control mode. US policy, on the other hand, says a person has to authorise when weapons are fired. Drones don’t fire missiles on their own, but act as remote launch platforms for human operators. Neither the makers of the Russian robot nor the Strategic Missile Forces responded to New Scientist‘s request for an interview at the time of going to press. In the US, unarmed sentry robots called MDARS patrol nuclear sites and Marine bases, but there appears to be little appetite for armed robots. Thousands of US robots, known as unmanned ground vehicles (UGVs), were rolled out for bomb disposal in Iraq and Afghanistan. However, the trial deployment of SWORDS, an armed version of the Talon bomb-disposal robot, in Iraq in 2007 was cancelled due to “uncommanded or unexpected movements”. There were rumours of robots going rogue and turning their machine-guns on friendly troops. In fact, there were two minor incidents, one caused by a loose wire and one by faulty solder. But commanders were spooked enough to postpone SWORDS’ debut. Thomas Nash, director of Article 36, the UK-based arms control campaign group, is worried. “The prospect of states developing autonomous weapons systems that would identify targets on their own and attack them is a grave concern for humanity,” he says. He should brace himself. Russia’s armed UGVs may soon be called on to fight in the front line. A promotional video for the interior ministry shows their commandos training with an armed robot. Space robot research could help improve vehicle communications, Ford says. Professor Vladimir Mulukha of the St. Petersburg Polytechnic University shakes hands with the mobile humanoid “Justin,” one type of robot used in Ford’s space robots research project. Ford’s latest research project is out of this world. Really. It’s in space. Ford Motor Co. is teaming up with researchers at the St. Petersburg Polytechnic University in Russia to study communication between robots at the International Space Station and Earth in the hope of developing better systems for connected cars. The three-year project will observe the communication models of robots in space to understand how vehicles can communicate better with other vehicles, the cloud and with such infrastructure elements as buildings and traffic lights. Such communication can prevent congestion, reduce accidents and deliver messages to drivers. Researchers also hope to learn more about how emergency vehicle communications can be improved. For example, Ford’s research looks at the potential of using vehicle-to-vehicle communication in the event an emergency message can’t be sent from a vehicle to the cloud because of network failure. They say a call for help could travel through other vehicles and pieces of infrastructure until a connection to first responders is found. Many of the technologies being used by robots on the space station — including dedicated short-range communication, cellular LTE wireless broadband and mesh networking — are in development or already being used in cars and other applications on Earth. After studying the robots, Ford engineers hope to develop an algorithm that could be integrated into connected-car systems that would route messages through the appropriate network based on its urgency. Emergency messages would travel through faster, reliable connections, while entertainment-related messages might use networks with a lower priority. The robots that the researchers will work with include the JUSTIN Humanoid, EUROBOT Ground Prototype and NASA Robonaut R2. Grishin Robotics is a global investment company that is dedicated to supporting personal robotics around the world. With an initial $25 million to invest in various projects and initiatives, Grishin Robotics is focused on raising the profile of the robotics industry and helping robotics entrepreneurs advance their products and ideas. Grishin Robotics was founded by Dmitry Grishin, the co-founder and chairman of the Mail.Ru Group, which is the largest Internet company in the Russian-speaking world and one of the biggest in Europe. Dmitry is the sole investor in Grishin Robotics and personally considers each prospective opportunity, supported by a team of professionals. The company has offices in New York, USA and Moscow, Russia. The rapid cultural, societal and economic shifts in the last few years are dramatically changing life as we know it. Robotics has a big role to play in responding to those changes and positively influencing the lives of everyday people all around the globe. Everyone from aging populations, who need service and assistance, to young people, who crave unique and more accessible leisure activities, will benefit from innovation in the robotics field. Grishin Robotics aims to facilitate the development of the robotics industry by creating a supportive environment for the industry, injecting much-needed capital, and providing business counsel for up-and-coming entrepreneurs and startups. Grishin Robotics will facilitate global robotics development with a particular focus placed on driving mass-market penetration. Over the next 10-20 years, robotics will become an integral part of everyday life for millions of people, and Grishin Robotics intends to play a leadership role in making that happen. We will focus on raising awareness of the industry across all sectors, including the business and scientific communities, the general public, and young professionals. Grishin Robotics will work with universities and specialized media around the world, as well as with governments and businesses concerned with the robotics industry. Serving as a catalyst to unite several disparate, interest groups, Grishin Robotics aims to be a key player in accelerating the next generation of robotics innovation. Born in 1978, Dmitry Grishin is considered as one of the most successful young entrepreneurs in Russia. After graduating with distinction from the Faculty of Robotics and Complex Automation (Department of CAD Systems) at Moscow State Technical University and working as a software engineer on several projects, Dmitry joined Mail.Ru in 2001. He became CEO of Mail.Ru in April 2003. In 2005, he co-founded the Mail.Ru Group. He then assumed the CEO role of the Mail.Ru Group in 2010. In that same year, he helped transition the company as it went public on the London Stock Exchange. Dmitry became elected Chairman of the Mail.Ru Group Board in 2012. Currently, Dmitry also serves as the head of the department of Information Technologies and Programming at St. Petersburg State University of Information Technologies, Mechanics and Optics. His passion for innovation led him to found the Russian Code Cup – the largest competition for programmers in Eastern Europe. Through the Code Cup and other projects, he continues to foster growth in the technology sector worldwide. Grishin Robotics invests in personal robotics projects. We’re looking to fund startups interested in distributing their already working products to the mass market. If your project fits this description, you are eligible to apply for investment consideration. To apply for Grishin Robotics funds, please send your project description, business plan and any other relevant materials toinfo@grishinrobotics.com Due to the large number of mails we receive, please note that it may take several weeks to consider each application.